Moebius Universal Monsters Boris Karloff Frankenstein Model Kit - BACK IN STOCK! MyMovieMonsters.com > Model Kits > Moebius > Moebius Universal Monsters Boris Karloff Frankenstein Model Kit - BACK IN STOCK! This brand-new, sealed, all-plastic assembly diorama model kit of Boris Karloff as Frankenstein's Monster is licensed from Universal Studios by Moebius Models. 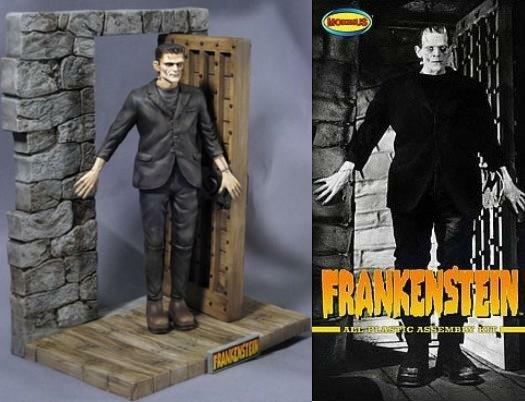 Diorama kit depicts Boris Karloff as Frankenstein's Monster and includes base and dungeon wall with door. As with all Moebius reproduction kits, FRANKENSTEIN comes in the same, classic style as kits of yesteryear! Brand-new and factory sealed. Picked directly from the manufacturer's carton. This is one NICE BIG kit! The classic box measures 13" x 7" x 3 1/2". This 1/8 scale model is recommended for collectors 15 years of age and older. Skill level 3. Paint (not included) and assembly required. Stock photo shows awesome example of what this high-quality kit can look like!